A passenger train on a newly opened Amtrak route jumped the tracks on an overpass south of Tacoma on Monday, slamming rail cars into a busy highway, killing at least three people and injuring about 100 others, officials said. The derailment of Amtrak Train No. 501, making the inaugural run of a new service from Seattle to Portland, dropped a 132-ton locomotive in the southbound lanes of the Northwest’s busiest travel corridor, Interstate 5. Two passenger coaches also fell partly in the traffic lanes, and two other coaches were left dangling off the bridge, one of them wedged against a tractor-trailer. On the highway below lay five crumpled cars and two semi-trucks, and huge chunks of concrete that were ripped away from the damaged overpass. All 12 of the train’s coaches and one of its two engines derailed. The National Transportation Safety Board sent a team to investigate everything from the speed of the train to whether a technology known as positive train control could have slowed it. 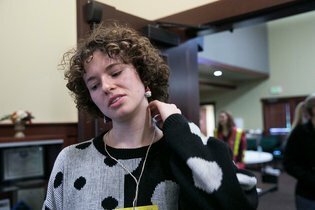 “It felt like the end of the world, and I was standing amid the wreckage,” said Emma Shafer, 20, a modern-dance student who was napping aboard the train with her shoes off when it derailed. She found herself in a coach dangling at a steep angle toward the highway — the man behind her yelling, his legs pinned, while a parent trapped with a baby in a restroom banged on the door for help getting out. The crash, at 7:33 a.m. about midway between Tacoma and Olympia, killed at least three people, local police and fire officials said late Monday afternoon. Earlier, a federal official briefed on the crash said that six people had been killed. Some of those injured were in vehicles on the highway and not on the train. But investigators are still going through the wreckage and could not say for certain how many people had died. “It appears that all of the fatalities are contained in the rail cars that went into the woods,” said Detective Ed Troyer, a spokesman for the Pierce County Sheriff’s Department, adding that rescue workers were using chain saws to try to reach victims in those cars. CHI Franciscan Health, a regional hospital network, said the injured were transported to hospitals, including four who were classified “level red,” reflecting the most severe injuries. President Trump wrote on Twitter that the crash on Amtrak’s Cascades service showed the need for increased infrastructure spending. In fact, the tracks where the accident occurred were brand new and the result of a recent infrastructure investment program. Backed by the state of Washington, Sound Transit, the regional transit agency, used $180 million from the 2009 federal stimulus package to buy an old 14.5-mile stretch of track and upgrade it for faster passenger service. 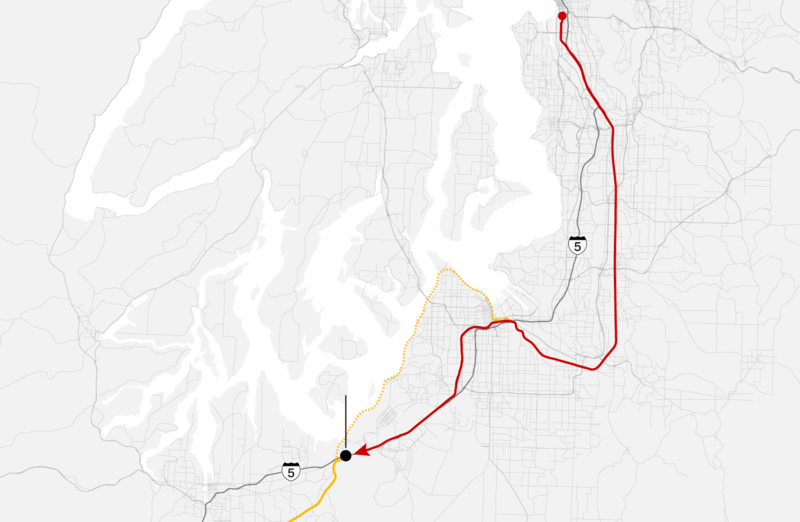 The project, known as the Point Defiance Bypass, was devised to allow Cascades trains to stop using a more roundabout route that they shared with freight trains, making for faster, more reliable travel. The state also spent $58 million from the stimulus bill on eight new locomotives, specifically for that service. The Cascades service embodies the complex, overlapping responsibilities on many of the nation’s rail lines. Officials said the service is owned by the states of Washington and Oregon, and operated by Amtrak, whereas the Point Defiance Bypass track is owned by Sound Transit, a regional transit agency, and dispatched by BNSF, the freight company that used to own the line. “There have been a lot of trial runs” on the line, said Ms. Olson of Amtrak. She said it was far too soon to discuss a cause of the disaster. An Amtrak train derailed onto Interstate 5 in Pierce County, Wash., on Monday. The train had previously run on a track along Puget Sound. To shave time from the service, the train had been rerouted further inland. The Washington State Department of Transportation has said that the entire Cascades route will have the system by mid-2018, but it was not clear whether it was in operation on Monday on any part of the line. Positive train control could have prevented some of the nation’s worst rail disasters, like the 2008 collision of a commuter train and a freight train in Los Angeles that killed 25 people, or the 2015 derailment of an Amtrak train in Philadelphia that went into a curve at more than twice the allowed speed, an accident that killed eight people. Gov. Jay Inslee of Washington, who declared a state of emergency, cautioned against jumping to the conclusion that excessive speed or shoddy work upgrading the line was to blame for Monday’s crash. Interstate 5, the main route linking the cities along Puget Sound, was closed to southbound traffic, and vehicles heading north moved slowly past the wreckage. Officials said they did not know how long it would take to remove the remains of the train, make sure the bridge was safe to pass beneath, and reopen the southbound lanes. Paul Woodbury, 29, who was in the sixth car of the train when it derailed, described a chaotic scene, with severely injured people on the ground and screams piercing the air as he climbed out of the wreckage. Once outside, in the cool morning mist, “people stood around, shellshocked,” he said, until emergency workers came to get them. Other survivors told local news media about picking through broken glass and twisted metal, struggling to pry out windows to escape, and using the flashlight function on their cellphones to see in the ruined, darkened coaches. Witnesses told of drivers leaving their vehicles on the highway to help pull people from the wreckage. Later, some of the rail cars were too precarious for rescuers to enter in search of victims until later in the day, said Brooke Bova, a spokeswoman for the Washington State Patrol. The Cascades line is popular, running through spectacular scenery — the sound, forests, farms and, most striking of all, the Cascades range, including Mount Rainier. In the past, the trip between Portland and Seattle has taken about four hours.